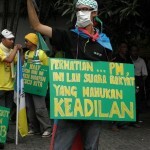 protest against the peaceful assembly bill – welcome! with reference to this post of mine regarding the peaceful assembly bill, which have many people up in their arms against it. as expected, the public will come out in full protest, rightly so. over the weekend, a few states, rally the people in certain places to protest against this bill which everybody says it is very repressive. penang has its protest last sunday and i was there, together with my fellow citizen journalist, lim, to cover for komunitikini. well susan loone was there too and she already have her story up at the main malaysiakini site so i guess i don't have to write so much for komunitikini anymore. i will write a little… to go with the video and i have lots of pictures which i will send to komunitikini photo blog (and later put up my facebook photo album), that's why now here i only put up 3 photos. well, since you can read susan's story on the protest in penang (see below, as CnP), i don't have to tell about what happened then. 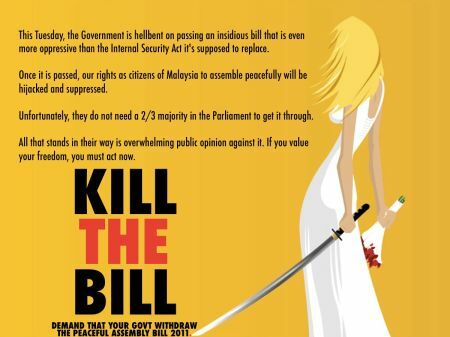 those of you who are in KL, don't forget to join the lawyers for their freedom walk on tuesday when parliament will be in session to pass this bill. no, no, we must not let the bill be passed. if passed, gone is our freedom to assemble. the bill is very silly when you come to think of it e.g. the 30 days notice. how on earth to give 30 days notice? when people protest, they usually do it when the issue is hot. after 30 days, there's no point to protest. also the part about no assembly with 50 metres of certain restricted areas e.g places of woship, schools, petrol stations, etc is also silly. i'm sure you have read so much about the complains here and there by so many people, so i don't have to 'get tired' to complain about it here. i support their protests and what they said! WE MUST KILL THIS BILL! The protest against the contentious Peace Assembly Bill proceeded peacefully without any disruption from the police in Penang yesterday. 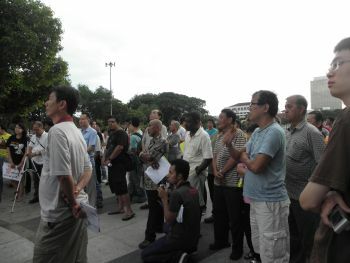 More than 100 people gathered at the famous Penang Speakers’ Square to stage the protest, organised by human rights group Suaram, with the presence of several state executive and municipal (MPPP) councillors and assemblypersons. The gathering was the second following the protest by 400 people at the Kuala Lumpur City Centre on Saturday who made it loud and clear they regard the Bill as "unconstitutional". Those present in Penang on Sunday included DAP’s Tanjung elected representative Chow Kon Yeow, Komtar rep Ng Wei Aik, Kebun Bunga’s Jason Ong, MPPP councillors Ong Ah Teong and Lim Mah Hui, and Lim Lean Geok Foundation chairperson Toh Kin Woon. During the protest, the group punched the air with their fists, showing their discontent against the Bill and hoisted placards into the air as they shouted 'Hidup rakyat!" and denounced the bill as being against the spirit of the right to peaceful assembly. Although police cars patrolled around the open field in Esplanade before the event started, there were only a few Special Branch officers at the scene, who did not disturb the gathering. Toh, a former Gerakan Penang state exco, criticised the bill as one that appears to guarantee freedom of assembly but in reality imposes more restriction on the public than previously. "Prime Minister Najib Razak had promised to bring reform on Sep 15, to make Malaysia as one of the most democratic nations in the world. But the bill proves that he was lying," said the veteran leader. 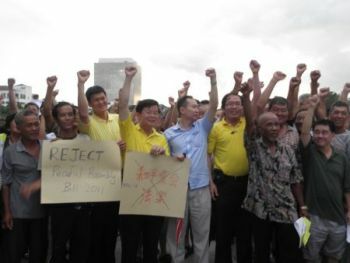 Chow (left), who is also Padang Kota assemblyperson, expressed hope that the government would withdraw the bill, adding that "more views should be collected from the public before recommending any new law". Other Pakatan Rakyat leaders had also expressed the demand that the bill be scrapped and not merely amended, on grounds that they felt it restricts freedom more than protects human rights. 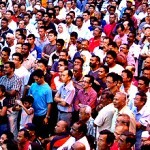 The proposed law created uproar, after which the cabinet instructed de facto law minister Mohd Nazri Abdul Aziz to review and amend the Peaceful Assembly Bill 2011. Even with this new development, however, critics still argue that restrictions in the Bill are still too stringent, such as the outright prohibition of street protests, and the 30-day notification period, which they say is too long. Ong said the more the government seeks to interpret the definition of an assembly in its own terms, the more the government would end up "depriving" freedom of assembly as guaranteed in the constitution. The protest follows the launching of the Local Democracy Month at the same venue earlier. The event is co-organised by the Penang government, Penang Suaram, other local groups such as the Sembang-Sembang Forum, Campus Ministry Office, Amnesty International Malaysia, Komas, People's Green Coalition and SERI-Penang Institute. On another matter, Chow, who is state DAP chief, said former Bar Council chairperson Yeo Yang Poh, who was supposed to advise the state on local election issues and had proposed that the state government bring the issue to the federal court to decide whether it can hold local government elections. His job has since been taken on by prominent lawyer, Tommy Thomas, announced Chow., and Thomas has new suggestions to go about the matter. "Thomas proposed the state government to enact a state law to hold the local elections, then let the court decide whether the state law is against the constitution or any acts," he told the crowd yesterday. "I will brief the state exco regarding Thomas's suggestion which was received this week," he added. Chow agreed that the state can pass the law at the local level and then wait for the federal government to challenge it in court. However, he added that it would better if the state government take a more "proactive step" to seek a declaration from the court that it can indeed hold local elections.